"I was taught to crochet by my grandmother when I was very young. After many years of refusing to learn how to knit, I finally gave it a try. Now I teach both techniques. I work a full-time day job, so you'll normally see me at the shop during evenings and/or weekends." 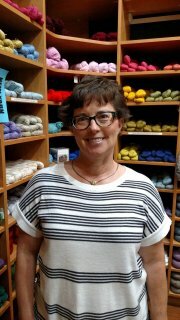 "I walked into Skeins On Main in 2012, hoping to get help on an afghan that I had started crocheting many years before. After many classes, and multiple times taking out what I had worked up, Lori realized the instructions on my pattern were 'destructions.' Needless to say, that afghan was finally finished. 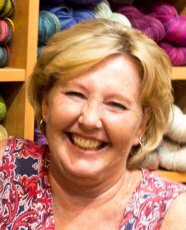 I have blessed Lori with two classes per week for a few years now and knitting and crocheting are a big part of my life, and also my daughter's, who now takes classes with Lori on Saturdays. Ever hear, 'Don't leave home with out it?' That's a knitting project for me. The staff at Skeins and all my classmates have made knitting at Skeins a great experience. So great that I now work at the shop part-time. One day my plan is to retire to Florida. I sure hope they knit down there! Working at Skeins is an ongoing learning experience. Whether it's learning about weights of yarns, what the yarns are made of, touching the different textures, putting colors together... it's fun! I never tire of hearing what a beautiful store Skeins is. Customers come from all around. 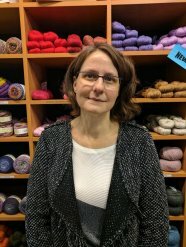 I'm not an instructor, but when you stop in I know there will be something I can help you with, pick a pattern, yarn for a pattern, and help with accessories. I can't wait to meet you. See you soon!" "My mother taught me basic knitting as a teen. I returned to it about twelve years ago. 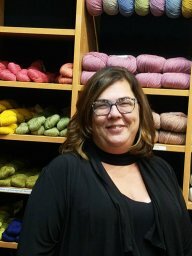 I enjoy learning new techniques, taking on larger projects (like an all-cabled afghan out of hand-dyed yarn), and working in the shop when I can. When I'm not there and I'm not at home or working at the hospital, I also enjoy golf, scuba diving, traveling, and watching old movies." "I taught myself to knit at 23 years old, when I decided it would be a wonderful idea to make a sweater (complete with a kitty cat face) for my toddler. When I actually accomplished this with surprisingly few mistakes - hey, seams showing on the outside is a design element... design element, people! - I was hooked and have been knitting as life allows ever since. When I'm not in the shop, working on my current knitting project, or making natural skincare products, you'll find me avoiding the housework with a variety of hobbies ranging from gardening, to mud runs, to target shooting, to sitting on the beach."